Highly Collectable Antique Samplers can be a very wise investment. A sampler is an embroidered panel of fabric sewn as a reference or a to demonstrate a range of sewing skills and different stitches. By the 18thC most antique samplers were sewn by young children, following patterns from books. They typically incorporate letters, numbers, a short poem or motto, the name and age of the child and the date. The word sampler, comes from the Latin word exemplum, meaning an example to be followed. Sampler stitching was carried out to encourage sewing skills in stitching for use in later life. A sampler would probably have a variety of different stitches, and would be kept by the girl as a reference for future work. It would have been the young girls first attempt at sewing / stitching. The history of samplers dates back some 400 years and could be earlier, the first recorded sampler was made by a Jane Bostocke back in 1598 (currently held at the Victoria & Albert Museum). The history of tapestry goes back before this, ie; the Baeyuex Tapestry depicting the battle of Hastings in 1066. The samplers of this era where generally very long and thin and are known as Band Samplers and are pieces of cloth with a range of stitches. The work can be signed and dated. Samplers of this era are very rare. 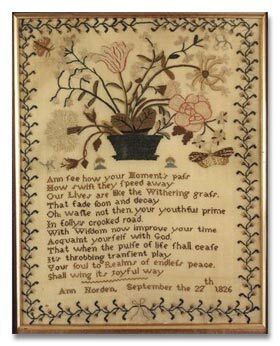 During the 18th and 19th centuries, samplers became more and more sophisticated, with the addition of biblical verses, pictures and complex stitches. 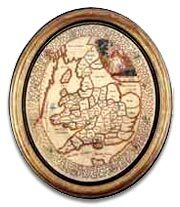 The later half of the 18th century saw the first map samplers, which depict pictures of countries and their geographical outlines. Although not necessarily accurate they are intricate pieces of work. During the 19th century, samplers became an important part of the school curriculum. Young girls were encouraged to sew and stitch to prepare themselves for their role in life. These samplers tended to be simpler, usually only having alphabets, numbers and a name and date with possibly the name of a school. The age of the stitcher can range from as young as six up to fifteen years. The average age being eleven. Antique samplers are very popular among collectors, Americans in particular show a great interest in collecting them and their popularity as an antique collectors item is growing. Today antique samplers in good condition, with reasonably good colour, can bring anything up to £500 GBP or more.